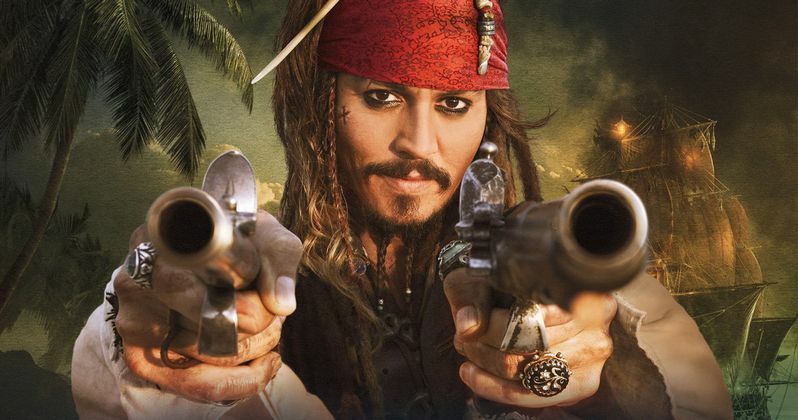 So, it turns out that Johnny Depp might have really changed Pirates of the Caribbean 5. Possibly not for the better. At the very least, this doesn't sound very good on paper. Speaking of not sounding good on paper, the change in question has to do with Depp reportedly rejecting the first script for Pirates of the Caribbean: Dead Men Tell No Tales because it featured a female villain. And his reasoning is the real head scratcher. Veteran screenwriter Terry Rossio recently wrote a very lengthy post on his Wordplayer blog about something he calls "time risk." Buried in this rather lengthy post is a pretty interesting claim. According to him, Johnny Depp not only rejected his draft of Pirates of the Caribbean 5 due to it featuring a female villain, but because he thought that would be too reminiscent of what he did in Dark Shadows. Here's what Rossio had to say about it. "My version of Dead Men Tell No Tales was set aside [just] because it featured a female villain, and Johnny Depp was worried that would be redundant to Dark Shadows, which also featured a female villain." If this is true, it is more than bizarre. For one, a female villain might have been a nice change for the Pirates of the Caribbean franchise, since we're heading into the fifth installment. But really, it is citing Dark Shadows as the reasoning for this rejection that is truly insane. For one, Dark Shadows was a Tim Burton movie that has nothing to do with the Pirates franchise. Yes, it has a female villain, but many moviegoers probably don't even know or remember that because Dark Shadows was kind of a bomb at the box office. If Depp's reasoning is that the movie bombed because of the female villain, that would be further misguided, but there is no evidence that suggests he even tried to reason it beyond saying that he did a movie five years ago with a female villain in it. It is also possible that Terry Rossio's version of the screenplay for Pirates of the Caribbean: Dead Men Tell No Tales just wasn't very good. But according to him, that isn't very likely. He seems quite confident that his version. Here's some more of what he had to say in his blog post, which could be perceived as a bit arrogant, or at the very least, possibly overconfident. "Usually when I go back to read a screenplay that wasn't produced, it holds up, often better than the film that was eventually produced. Sometimes it just takes a single decision by a single person, often just a whim, to destroy years of story creation and world-building." Terry Rossio's script didn't wind up getting used, but he does still have a "story by" credit on IMDB, so some elements of his story are probably still in place in Pirates of the Caribbean 5. Instead, Disney, and supposedly Johnny Depp, signed off on Jeff Nathanson's version of the We'll soon see how that turned out, because Pirates of the Caribbean: Dead Men Tell No Tales comes out this week.